Q: What does US-VISIT, the TSA's Registered Traveler Program, and the TWIC Program have in common? A: The promotion of biometric technology spurred by the Department of Homeland Security. You have issues. Privacy issues. Findings from the Ponemon Institute 2004 Survey on the Public's Perception of Identity Management, sponsored by the International Association of Privacy Professionals and Electronic Data Systems Corp., support the use of biometrics for identity management. More than 70% of respondents said they could accept certain kinds of biometrics, such as a voice recognition or fingerprinting system. The No. 1 reason is convenience. More than 88% of respondents believe biometrics will make identification more convenient and accurate. Among those opposed to biometrics (11%), most appear concerned about secondary or alternative uses of this data. Top 5 privacy issues of 2005. New additions to the border control have been added in El Paso and New York. US-VISIT is three quarters of the way to meeting its schedule to complete the deployment of entry procedures at the 50 busiest land ports of entry by December 31, 2004. Biometric Checks at border - New York. A car or a mood ring? You decide. Even I'm not exactly sure how this would work - a car that senses your moods, and adjusts things such as lighting accordingly through biometric data. I think it's safe to say this is one of those concept cars that will never see production. A car that senses the mood you are in. Whaddya know, the smart gun works. They tested the gun they were working on at NJIT, and it's going as planned. Dynamic grip recognition is like hand geometry, except when you grip something, it will identify you, and there's no extra step in-between that needs to be added. They hope to deploy the technology in other places, like for steering wheels. 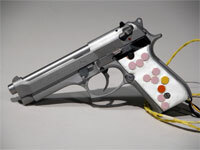 Shots fired at Bayonne range prove smart gun technology works. You are how you walk. Wondering what's happening with gait biometrics? This is the technology that can use regular video cameras, and identify you based on how you walk. It's not talked about as much because there are more privacy issues relating to a technology that can label you without even knowing it. Unlike fingerprint, you don't have to consciously do something in order to have it identify you. Therefore research and advancements have been hindered because of protests that use of such recognition could be invasive. But for those exact reasons is why we should consider its applications. At times that may become necessary. Nixon has conducted extensive research on the use of gait as a biometric. Its advantage is that it is effective at a distance or where only low image resolution footage is available, as with CCTV cameras. Nixon worked with other researchers in the US Defense Advanced Research Projects Agency's HumanID at a Distance project until the scheme was canned "because of US privacy concerns". Gait advances in emerging biometrics. Well it looks like it won't be Kerik afterall. Now who will step up to lead the DHS to success? Who, I ask you, WHO?? Maybe someone that never hired a nanny or housekeeper in the past. Maybe someone that, no matter how wealthy they are, still feels cleaning up after yourself is the way to go! Kerik withdraws from DHS over 'nanny problem'.